HiFi or High fidelity is a term used to indicate equipment that reproduces a high quality of sound. The highlight of Hi-FiÂ equipment is inaudible noise or distortions and a natural frequency response.Â Hifi amplifiers are known to create sounds with utmost clarity so it is a dream of all music lovers to get their hands on one. Of course, it is not just the amplifier that is required to get a no-noise sound output. But our project here only involves making the amplifier part ie, amplifier circuit. Here is the circuit of a 2X12 watt HiFiÂ amplifier circuit using IC TDA 2616 from Phillips. This is a quite simple and robust circuit using only very few components. Being this small makes the circuit ideal for a portable power amplifier. 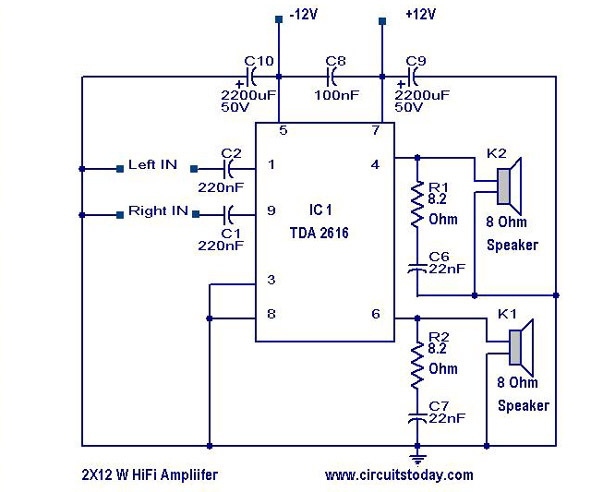 This circuit delivers 12 Watts power onÂ 8 Ohm speaker for each channel at +/- 12 V dual supply. The TDA2616 is aÂ stereo power amplifier IC that comes in a 9-lead single-in-line (SIL9) plastic power package (SOT131). This IC is specially designed for mains fed amplifier circuits such as stereo radio, tape and television. The IC has a good gain balance of both channels and Hi-fi in accordance with IEC 268 and DIN 45500 standards. Also, the IC TDA 2616 has a special inbuilt circuit for theÂ suppression of noise signals at the inputs during switch-on and switch-off. This prevents click sounds during power on and power off. All capacitors except C10 & C9 are ceramic. All capacitors must be rated 50V. Use a well regulated and filtered +/- 12 V dual power supply that is able to provide at least 2 A continuous current. Hi if i just use normal 12v – 1A power supply adapter. And attach its positive to +12v and negative to -12v of your circuit. Will it work without giving noise. On standby when we haven’t connected anything to the input mostly circuits like this gives huge noise. I add potentiometer but nothing happens to make hum sound low. Can you please help me???? I am tried this amp. But it sound is not clear it continous cracking . hi .. This Ranjan from bangladesh ..
this is so simple circuits .. pls cheak this circuits without veritable resistor , and must use 220nf for input , and 8.2 ohm sires with 22nf capacitor . i have two woofers of 70 watt what type of amplifier i should need 70 watt or 140 watt ??? This is good for about 7Wrms into 8ohms with a 12V supply. With a 16V split supply, this chip makes 12W into 8 ohms at .5% THD. C9 & 10 need only be 25 Volts. R1 & 2 should be about 2 ohms. Definately need a 4 sq in or larger heatsink.